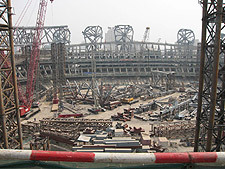 Many events for the Beijing 2008 Olympic Games took place in the brand new, 100,000-seat National Stadium. Design plans for this massive structure began in 2003, when Swiss architects Jacques Herzog and Pierre de Meuron were selected by the Chinese government to design the new stadium, which because of its curved steel-net walls was soon dubbed by locals as the "bird's nest." BIRD'S NEST chronicles this five-year effort, as well as Herzog and de Meuron's design for a new city district in Jinhua, involving hotels, office and residential buildings. Both projects involved complex and often difficult negotiations and communications between two cultures, two architectural traditions and two political systems. Herzog and de Meuron, the Basle-based architects, find themselves working with China's largest state construction company, Chinese artist and architect Ai Wei Wei, lawyers, and countless government bureaucrats. The film reveals how Chinese cultural tradition affects both projects, with the architects carefully researching esthetic and philosophical concepts of Chinese society and culture, attempting to define universal qualities of "beauty" and being careful to avoid imposing Western ideas, and above all to create buildings that will blend in culturally by being sensitive to Chinese cultural traditions and ways of living. 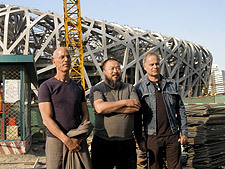 In addition to following the progress of both projects, from initial design and groundbreaking, BIRD'S NEST features interviews with Herzog and de Meuron, Chinese architects Ai Wei Wei and Yu Qiu Rong, plus additional commentary by cultural advisor Dr. Uli Sigg, the former Swiss Ambassador to China, Professor Zhi Yin of Beijing's Tsinhua University, and Li Aiqing, Chairman of Beijing State-Owned Assets Management. In showing the cultural barriers, political pressures, aesthetic concepts, client demands, and budgetary limitations of these major architectural projects-one intended to promote China's international appearance, the other designed to cater to the daily needs of the Chinese people-BIRD'S NEST explores how such international endeavors are helping to develop a "new tradition" in architecture.